I just left Dendy Opera Quays where I watched “Chasing Birds”, a Sydney Film Festival 2008 selection following the antics of 3 teams of keen bird watchers – the Hunter Thickheads, the Wacked Out Woodswallows and the Hunter Home Brewers – as they competed in the 2003 annual NSW ‘Twitchathon’. The directors Greg Woodland and Gina Twyble chose to film the competition because they were interested in the highly competitive & obsessive sub-culture of birdwatchers and twitchers. 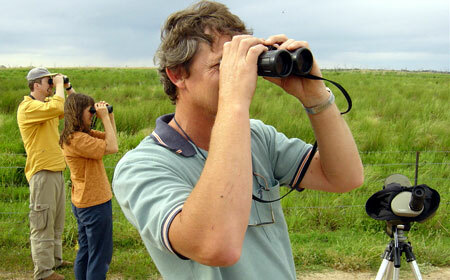 The aim of the Twitchathon is to spot as many birds as possible over 24 hours. The best tactic is to cover as many habitats as possible, so the teams travel huge distances in their 4WD’s, dashing in and out of rainforest, woodland and marshes. The tactics and rules of the Twitchathon reminded me of the sport of Rogaining. Rogaining involves long distance cross-country navigation by teams of people on foot and the objective is to collect the highest score by finding checkpoints within a set time limit. The championship rogaine is a continuous twenty four hour event. Teamwork, endurance, strategy and map reading are features of the sport. While I’ve never participated in organised bird watching clubs, I’m a keen wildlife photographer as you can see by my photos of a Rainbow Bee Eater and Rainbow Lorikeet that I’ve included in this article. Sounds like a lot of fun! Many people don’t get 200 birds on their lifer list, much less find that many birds in 24 hours. As a former member of the hunter bird watchers club I can vouge for the fanatism of these guys. It was a joy to tap into their experience and see birds I wouldn’t otherwise seen. Training the ears is just as important as training the eyes! One part of the competition is that two people have to see the bird for it to be marked off the list. So the comment that 2/3 are heard is not entirely true. Anyway A great blurb! Happy birding! I am just getting into the hobby and this article was very helpful. Thankyou for posting the contact details for some valuable resources. I was able to see this film some time ago and i really enjoyed it. Twitchers make and excellent subject – dogged enthusiasm and obsession always make for good viewing – Twitchers also get a bad press and this film helped I think – hey birdwatchers are people too! Hreally enjoyed the film made on you all doing the chasing birds, I am a keen photographer and love shooting birds, with the camera. So hard to find what birds are in what areas, this film was so enlightening. Keep enjoying your bird watching and chasing.